It's not often you spend a week living in a valley, glamping in a luxury Belle tent, being fed delicious array of plant based food, learning indigenous Māori wisdom in a geodesic dome, and dancing into the night in a Mongolian yurt. It has now been six weeks since I returned from "Welcome Week" with the Edmund Hillary Fellowship. With my perspective and sense of possibility completely blown wide open, I have spent the few weeks following this experience in deep reflection, awe, and integration. Taking the time to assimilate the powerful lessons learnt, relationships forged, and the ideas cultivated, which still continue to seed and grow. Seeded into a database network of entrepreneurs, activists, investors, philanthropists and luminaries, I have been connected to people running million dollar blockchain companies, stewards in renewable agriculture, scientists democratizing space exploration, billion dollar impact investors, and Emmy award winning filmmakers documenting the forefront of human connection. The most incredible thing is that all of these people share a common vision for the world. Hand picked for the fellowship for their unique set of skills and talents, they all carry their own medicine for the world, motivated to use their projects and networks to create massive positive change and transformation of our current world story - creating something Author Charles Eisenstein calls "the more beautiful world that our hearts know is possible." Being part of this league of extraordinary people has been the honour of being chosen a fellow of 'Kopakopa' Cohort (42 out of now 108 fellows in total)- named after the common and medicinally potent grass herb "Kopakopa" - te Rongoā ki te Ao. (the medicine of the world). Upon our arrival in Aroha Valley, Upper Hutt for the EHF Welcome Week, Savannah and I (yes we could bring our partners and families) began to meet the community. Witnessing the caliber of people present was enough to get me thinking I had somehow duped the selectors with my application. How had I somehow slipped into this group of incredibly game changing people? With a shiver of self doubt in my mind, we gathered the next morning outside the geodesic dome to be officially welcomed to the land with a traditional Pōwhiri ceremony. As the sacred weaving process of Pōwhiri began, we moved into a space of noble silence. The women stood at the front, and men at the back. As Pekaira began the Karanga (call), beckoning us forth, weaving our collective whakapapa (ancestry) together in worlds not seen - I witnessed a Kahu (hawk) fly directly overhead. At this moment, I knew there was something deeper about what was happening here in Aroha Valley. With the presence of this being and through the guidance of the Karanga, the space around me transcended into a new space of spiritual possibility. The hawk illumined to me the potency of this meeting, the sacred purpose, and the greater meaning of each one of us coming together at this place, and this time. At this moment, my understanding of why I had been included in this group of 42 (only 12 kiwis) started to become clearer to me. Sharing a hongi by the people of the land and local Mana-whenua Ti Atiawa Taranaki Whānui, we took our places as guests on the Marae, opposite the home peoples - and in Tikanga protocol, we sat experiencing whaikōrero back and forth between parties in full immersion Te Reo, followed by our Waiata (song) "Rainbow Warrior" by Matiu Te Huki. There was no English spoken until the Pōwhiri process was complete. Where it was then 'unpacked' and explained in English from a Te Ao Māori perspective. For myself and numerous fellows, these sometimes spontaneous sessions with Tamahau, Pipiana, Pekaira, Matiu were often my favourite part of the countless amounts of Hui that ensued on the 4 days spent at Welcome Week. Across the 4 days, we became very familiar with Whānaungatanga - building relationships through our smaller whānau groups, collectively learning a deeper understanding of the process of Pōwhiri, and through solid guidance, we learned a greater appreciation of Tikanga Māori (traditional protocols) and how these values can be applied to business. With his guitar Matiu took us through various Kapahaka activities, and all things were infused with Te Reo wherever possible. For the benefit of our international whānau, the current Te Tiriti o Waitangi (Treaty of Waitangi) situation was also addressed, reminding us of the work which still lies ahead to heal from the past here in Aotearoa. Despite the work which still needs to be done, something special had happened at EHF. Throughout my life as a young, priveledged Pakeha (non-Maori), I had not witnessed a partnership and co-creation with the local Mana Whenua like this one - Ti Atiawa Taranaki Whānui (local Iwi from the Taranaki/Wellington region). Learning from my studies of Rongoā Māori and recently completing my first year of learning Te Reo, what I had experienced at EHF had set a new standard for us all in terms of global cultural collaboration - acknowledging the wisdom and leadership of Indigenous cultures in a time when we need the connected and heart centred leadership and stewardship the most. Savannah had thought she was coming with me simply to support - but was quickly adopted by her whānau (Ti Atiawa Taranaki Whānui), ending up being included as part of the Mana whenua and helping to facilitate on the journey in many different ways. One evening in the Yurt we were pulled out from the crowd as a couple to be part of The And experience, hosted by Topaz and Sonya. This was the (very vulnerable) experience which lead to Topaz winning an Emmy for his work in documenting human connection with www.theskindeep.com. Learning from the founders of EHF, Yoseph, Matthew and Brian, I found great inspiration that EHF and New Frontiers were born out of experiencing the magical culture from festivals like Burning Man, Kiwiburn, Prana, Luminate Festival 2019, and many other transformational events from around the world. With entrepreneurial minds from Silicon Valley, EHF has partnered with NZ's Enspiral, Immigration NZ, local council/community and many other impressive organizations. They family has invested into the land heavily, crafting the perfect environment to catalyze a transformational shift in planetary culture. Aroha Valley (historically named Whitemans Valley) is a magical place, with most of the food being able to be grown onsite in the grow dome, visitors are accommodated with composting toilets, and once barren farmland is being regenerated into native bush. It all resonated. It felt so familiar to me… Because creating this space for transformation was a similar vision I shared for Organic Mechanic. I had dreamed of the time when we could bring together the tribe to create massive shifts on a global scale… I had dreamed of the time when consciousness would meet and collaborate with financial abundance. He said that "a great light would one day shine out on the world from here." As I learnt more about this kaupapa, I found that www.ehf.org was birthed out of a collision of changemakers and the Hillary Institute of International Leadership, a charitable trust launched in 2007. The organisation shares a collective intention to bring together extraordinary leaders in the world who are addressing challenges across climate change, poverty, disease, peace, and justice. Using Aotearoa as an "incubation nation", a "base camp" for a better world - the Edmund Hillary Fellowship is setup as a nonprofit subsidiary of the Hillary Institute, honoring Sir Edmund Hillary's legacy of humble leadership, pioneering courage, ecological stewardship, teamwork, and generosity. One of the products of this vision, was the world's first "Global Impact Visa" - a programme where entrepreneurs and their families are granted residence in Aotearoa and connected into the ecosystem here in order to support a community of global change-makers and accelerate the innovation economy here in New Zealand. Up to 100 international and 20 Kiwi Fellows are chosen each year to build a globally-connected and locally-rooted community. Put simply, EHF is a community of high-impact entrepreneurs, investors and changemakers, collaboratively building solutions to global challenges from Aotearoa New Zealand, and leading the way to a better world. After 4–5 days at Welcome Week, EHF then hosts www.newfrontiers.nz - a ground breaking festival showcasing inspiring projects of the latest Cohort to an audience of 300+, again from all over the world. This festival happens at Trentham Racecourse in Upper Hutt every 6 months, welcoming in a new cohort of changemakers and giving them the stage to share their projects. www.newfrontiers.nz is happening again next year March 11–13 in Upper Hutt, and Cohort 5 is now open for application. To a few of the best weeks of my life and truly the closest thing I can imagine to the Avengers. A few months ago I took a risk and gambled all of my "self-investment budget" ($1000) from Organic Mechanic on an application to the Edmund Hillary Fellowship. I spent days and nights perfecting the application and with the help of Savannah Atai my transcript was fit for a day in court. It was 11.55pm and the 12am online submitting deadline loomed. Feeling confident about this process from my time at university, I quickly uploaded my application and at the last minute decided to add some extra photos. This meant the upload finished at 12.01am - and unfortunately, the automated technology coldly informed me I had missed the deadline. I felt helpless. Defeated, like a fish flapping about on the ground. This was one of the greatest tests of my own self belief - as I slumped off to bed, feeling robbed and sorry for myself. In the morning I tried frantically to contact someone for a late submission. Days passed and I didn't hear anything. The fire inside me began to dwindle... 2 weeks later I received an email offering an opportunity for a late submission - but it was going to cost me $650. Living from paycheck to paycheck whilst working on OM, Hemp For Victory and Aro Hemp Aotearoa, this was a stretch. But with the support and belief of my people around me - I was going to take the risk. In July, after multiple zoom calls, more applications and video submits, I received news that I had been selected as a Fellow of the Edmund Hillary Fellowship - my cohort being a group of 44, chosen from over 500 - including only 12 kiwis. This organisation had been developed in the spirit and memory of Sir Edmund Hillary, the first man to summit Mount Everest - similar to how I felt at this moment. EHF is an organization fostering humankind's potential from Aotearoa, bringing together worldwide impact entrepreneurs, investors and change makers to ascend to new heights of innovation building meaningful solutions to global problems. I'm looking forward to checking in with this crew and sharing the wisdom and guidance with my whānaunga back home after New Frontiers Festival in Nov.
On July 5/6th I went to the 2018 iHemp Summit in Wellington to throw down a korero, and launch Aro Hemp Aotearoa to the world. Over the last 6 years I have watched the Hemp industry evolve, and this gathering of industry and innovating minds alike to share ideas shows massive growth and some serious momentum on the way for Aotearoa. One of the main things the Hemp industry is lacking is education. Education of the public, the end consumer, the product innovator, the farmer, and the government. On all levels, we need to create and provide education about how low THC hemp is different to high THC Cannabis; Education about how hemp is good for the human body, the soils and the atmosphere; Education on what hemp is capable of creating and replacing; Education on how to grow hemp to a high standard in Aotearoa, and in turn how hemp can help solve the problems we face as a country and humanity looking forward 5-10 years from now. Although hemp is gaining more media attention, there is still a gaping hole in terms of educating the general public and the government on how hemp can be used. For the early adopters, there is no doubt that Hemp can help in a massive way to create a more regenerative future for NZ, but because of a lack of demand from our undereducated masses, our government is not currently empowering this industry to grow. As we see the exponential growth of plant based diets and lifestyles around the world, with something like 3 TBSP of dehulled hemp seeds per day (full of protein, essential fatty acids, magnesium, zinc and iron), Hemp can play a leading role in the reformation of the food system in Aotearoa. With hempseeds as a basis, we can create more naturally derived food products, supplements and health products that are both good for humans and good for planet. In the words of Cookie Time founder Michael Mayell, we should be encouraging existing food producers to make hemp versions of their products - but with current legislation pressures meaning the current rate for NZ grown seed is $27 per KG, financing this could be challenging without having to import cheaper seed from overseas producers like Canada. In terms of our current hemp legislation, and despite already being safe and legal for humans to eat all over the world, the NZ government still classes hemp foods as illegal for human consumption, and this is not set to change until 2019. Until this time, it is illegal to sell hemp Seeds for anything other than animal food. The main reason for this is because low THC industrial hemp falls under the same legislation as High THC cannabis - which means it is governed under the Misuse of Drugs act (an old piece of legislation published in 1975). This means that even though hemp is an industrial crop (similar to corn), and it should be governed by the Ministry of Agriculture, it is currently governed by the Ministry of Health. This means that MODA (Misuse of Drugs Act) needs to be relooked at before there can be any changes in the NZ Industrial Hemp regulations. This means what is required is a reformation of our current drug laws, which historically could take quite some time to get through parliament - but has been set for early 2019. Industrial Hemp is classed as a variety of cannabis which has less than 0.35% THC - Which means it is not going to get you high. THC (Tetrahydrocannabinol) is one of hundreds of cannabinoids in the cannabis varieties, and only THC is psychoactive. Other cannabinoids are powerful health supporting compounds that work on the natural cannabinoid system in the human body. Only about 10% of cannabis crops naturally exceed the .35% level of THC, varying from 10-30%, and these strains are what we call Medical/Recreational Cannabis, which are currently illegal in NZ. Because of a lack of education and out-dated legislation, industrial hemp is governed under the same laws as medical cannabis. From the above standpoint I do not see medical/recreational cannabis being legalized on a nationwide scale for at least the next 2-4 years. However certain groups like Hikurangi Cannabis Company have managed to slip through loop holes and achieve licenses to enable this to happen, and there have been small cases where patients have been granted access to use medicinal cannabis, and others to use an expensive pharmaceutical product called Sativex. Although the Labour government supports and sees the value of medical cannabis, the Minister of Health mentioned at the Summit that he has never seen a medicinal cannabis growers application come across his desk... 🤔 This means that with more educated public requests that this could help to tip the scale towards more accessible legalization. Through our experience with Aro Hemp Aotearoa, and from various expert opinions at the Hemp Summit, one of the most challenging aspects of growing hemp is harvesting and processing - which is an essential part of any hemp operation. At this point in Aotearoa, there is not wide access to the expensive machinery that is required to harvest and process hemp (seed dehulling, seed oil pressing, fibre decortication, seed cleaning and seed/fibre storage). This means that the access to this machinery and capital investment to set them us are an obstacle for first time and small scale growers. These machines I have mentioned are not simple "plug and play" operations - both requiring heavy capital investment and also skilled workmanship to operate and fulfill processes. For the industry to flourish here in Aotearoa we need NZ specific agronomy practices, regional processing facilities and harvesting equipment, new legislation and also large capital investment. Through being involved in Indigenous Māori networks and the NZHIA I have witnessed a strong presence of many small scale growers who are working together to pool resources and help to pioneer this movement for the betterment of the people and of the planet. If not directly involved in the industry, we can all play our part from a grassroots level first by supporting NZ made hemp products in the marketplace, and second by educating the masses of the many uses of hemp and the problems that it can help to solve in the food, clothing, housing and medical industry. Together we can create a regenerative industry here in NZ with strong values and systems which help to support the health of our local communities, the healing of our lands, rivers and waterways, and providing an economic leg up in our national and export market. Special thanks to Richard Barge, Mack Mackintosh, Midlands Seed + all sponsors for making the NZ iHemp Summit 2018 happen - looking forward to where we are in 2019. To get to know Te Ngahere, we must Listen. Watch. Notice the details. Be prepared to visit the forest, to build up a sense of really belonging, becoming part of the family of Tāne. To learn from the #Kaumātua (elders) is to be entrusted with the wisdom of traditional Rongoā Māori medicine. It is to carry the #Taonga (treasure), and realise that we are receiving not just the knowledge, but the responsibility to care for it and protect it. To ensure its survival. It is our duty as #kaitiaki to understand our interconnected relationship to our forests, our rivers, and our mountains. To understand that when a river or forest is sick/polluted, inherently part of ourselves is also sick. 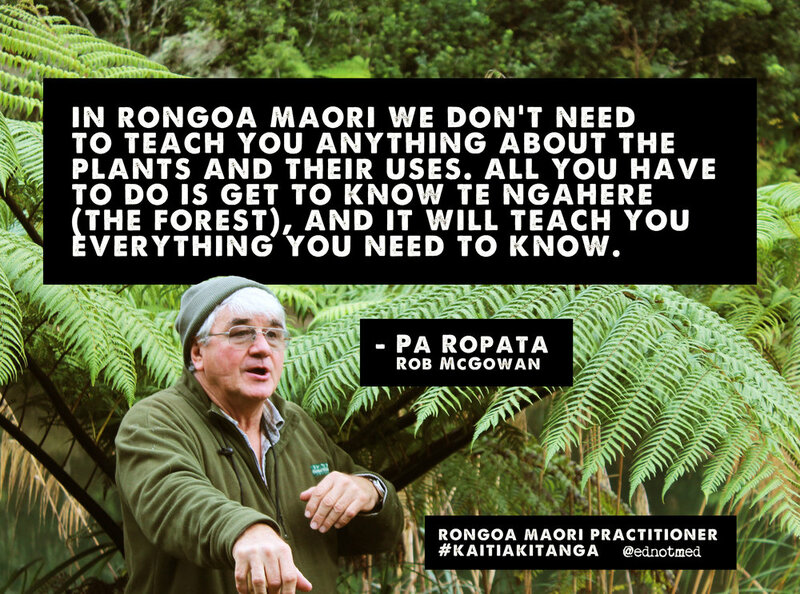 Rongoā Māori is so much more than the rakau (trees) and the medicinal chemistry in the leaves. It is about Te #Mauri (the life force) and Te #Wairua (the spiritual dimension) that flows through and connects all living things. The knowledge of Rongoā Māori grew out of the tradition of being part of the forest and the accumulation of generations of close observation of every detail. To really know Rongoā Māori, we have to become a part of that tradition. The native New Zealand Wood Pidgeon, endemic to Aotearoa and regarded as the "Gardener of the Skies"... Without them, our large native trees such as #Tawa, #Taraire, #Matai and #Puriri (seen in painting) would struggle to survive, as the Kererū play a crucial role being the only native bird big enough to carry seeds from the fruit of these larger trees, dropping them in new pastures for the #ngahere (forest) to continue to regenerate. Nationally, around 20,000 Kereru have been observed in Aotearoa, but due to predators (possums, rats and stoats) and continued habitat loss by native deforestation, these numbers may begin to dwindle over the next few years. This painting is the first of a series to educate and create awareness about our native birds and bushes of Aotearoa, drawing from conservation work and the #ketetuauri of indigenous Maori wisdom. In the photo above you will see New Zealand hemp legend Dave Jordan founder of @hempfarmnz separating the seeds from the mulch by hand at this years hemp harvest in April. During this time I visited with Cam Sims and helped out with the very manual tasks of the harvest, which without the help of dedicated and expensive machinery, requires a full community and days of committed labour to complete. As we approach planting season in NZ in late October, Dave and his wife Anne have been travelling across Europe to investigate the latest innovations in hemp growing, harvesting, and processing. This new knowledge will enable the Hemp Farm to take the New Zealand hemp industry to the next level, boosting both production volume and efficiency for local crops and growers. Organic Mechanic, Hemp For Victory and I have some special news to share about this years grow in the coming weeks - stay tuned. PLANT POWER - I was brought up with the classic Kiwi mentality of eating meat almost every meal and every day. Over the last 2 years, I haven't eaten a pig, cow, lamb, or chicken (or any other land dwelling animal) and I'm not just surviving - I'm thriving. Instead, I have adopted a mainly plant based diet, with the equivalent of perhaps half a fish per week, and free range, organic eggs from our neighbours and local organic stores IE Produc Huckleberr, and Wise Cicad. I won't buy dairy products on purpose, but if I do - I'll make sure it's organic and of the best quality. In complete transparency and contrast to that, there are also times where you might catch me eating a V-Twin Vege burger or even the off chance of a #glutenplus pizza covered in cheese. I am very aware and conscious of the impact on my body and the planet from my diet - and I am doing my best to be the change I want to see in the world whilst allowing the stretch room for experimentation and play. Cage farming and our modern ways of raising animals and cattle for us to eat is both an environmental, ethical and spiritual travesty. As a collective society many of us have become completely detached from where our food comes from, & this is a fundamental issue that is affecting us as a civilization. This needs to change now. We need to take responsibility for our consumer choices & stop supporting practices which are destroying the planet and the needless slaughter of innocent animal lives. If that is not yet hitting home, NZ has one of the highest intakes of meat & dairy in the world, and we also have corresponding highest rates of bowel and breast cancer... Not saying that meat is the reason for this, but an over intake of meat and dairy into a toxic, blocked up gut microbiome. If this post can help to encourage one person to cut their meat intake and become more conscious about cage farming and where their food comes from, then I'll be a happy lad. From 1860, King Tawhiao's reign would last for 34 years, peacefully guiding his people through some of the most turbulent eras of Maori-Pakeha relations. In 1863 during the invasion of Maori land by British forces under the pretext that Waikato tribes (United by Tawhiao) were "preparing to attack" Auckland, Tawhiao and his people were forced to retreat as refugees to the heartland of Waikato, which eventually became known as King Country. In the peak of his reign, King Tawhaio's mana and sphere of influence stretched from the Bombay hills to as far East as Tauranga, West as Raglan and as far south as Taupo. His visionary leadership and prophetic presence held a shining light of hope and an ideological example for his people (Followers of the King Movement) throughout these times. His values of Kaitiaki left a legacy for Maori culture, adapting to the rapidly changing Aotearoa landscape, with a dream for a self sufficient economic base, supported by the strength of its people. Native trees and foods symbolise strength and self-sufficiency in his statement "I shall build my own house, the ridge pole work be of hinau (tall forest tree), and the supporting posts of mohoe and patete (common trees). This who inhabit the house shall be raised on rengarenga (NZ Spinach) and nurtured on kawariki (Edible plant)." When I think about the damage that alcohol has caused in our society... How many cases of heart disease and liver toxicity directly attributed to alcohol consumption have ended lives... How many acts of violence, idiotic behaviour and bad decisions have been made under its influence... How our streets can be visually polluted with advertising from giant alcohol companies glorifying a life of decadence and splendour - it is no wonder our youth have a huge social problem with binge drinking. In this picture, are medicinal cannabis plants. A sister plant to hemp, (which focuses on producing seeds and fibre) as these grow beautifully fragrant flowers/herbs which can be dried & prepared for medicinal/sacramental and recreational purposes. There have been zero deaths attributed to Cannabis use around the world for the last 100+ years. People don't get violent when they smoke the herb. Nobody gets raped. People get creative, and it's quite hard to ignore the connection to Mother Nature and oneness one can feel. When it is used with proper preparation and wisdom, Cannabis can even cure and relieve chronic diseases and auto-immune conditions like seizures, Multiple Schlerosis, and even cancer. To the uneducated individual, it is quite likely that everything we think we know about cannabis is wrong. With my experiences I feel it is time to bring this out into the open. To make a point as to how we glorify the socially destructive nature of alcohol and suppress the healing and earth regenerating herb. The societal issues with cannabis are not criminal offences, but health issues. At the very least, it's time to decriminalise Cannabis, and open the doors for ways in which it can help and heal us as a society - the way that hemp certainly is. Organic Mechanic was born out of a dream to do things differently, to be liberated from society's ideals of having a career, of having a job, being a cog in the machine, working on someone else's dreams.. Instead we live life in the highest alignment of our own dreams, taking control of our own future and lifestyle full of freedom, abundance and adventure, all whilst creating the biggest possible positive impact on the world around us. Along the path, we have encountered many people who simply told us "no", people who couldn't see and appreciate our vision. But this has only given us more motivation to succeed. We are grounded in the affirmation that we are unstoppable, and feel in the words of Steve Jobs that "about half of what separates successful entrepreneurs from the non-successful ones is pure perseverance." That is spending the extra hours past midnight, sending that extra email, helping that person unload their stock from the car, getting right back up when things go wrong, and going the extra mile (every time) which is in our case brewing thousands of litres of kombucha while the world is still sleeping.. (Last night this happened - Yeeea Budgie Lemons Rajeev and JBoogie Jason Corliss.) Or leaving Splore Festival to go and build the ‪#‎OMshack‬ - yeeea Gradie Plums.. Or perhaps it is spending days on end delivering OM Kombucha to over 75 stores when the courier lets us down - Yeeeea Nicky Avos a.k.a. Nick Corliss. If you wake up every morning and aren't absolutely stoked, excited and inspired about the job or activity you are about to do, something needs to change. The legend ‪#‎JimCarrey‬ once said, "you could fail at a job you don't want, so you might as well take a chance on doing what you love."